Maria Luisa Frisa, Jean-Christophe Babin, Lucia Boscaini, Bonnie Clearwater, Stefano Tonchi, Gloria Marina Bellelli. Photo by World Red Eye. Fort Lauderdale, FL, February 8, 2016 - NSU Art Museum Fort Lauderdale held its Bellissima Gala on Friday, February 5. The glamorous black-tie evening presented by Bulgari, celebrated the 30th anniversary of NSU Art Museum’s modernist building designed by Edward Larrabee Barnes and the U.S. premiere of the exhibition Bellissima: Italy and High Fashion 1945-1968. The event brought together prominent figures from fashion, art, business and philanthropy and raised money for the museum’s education and exhibition programs. Guests enjoyed Italian-inspired cocktails, dinner and dancing, and an exclusive preview of the exhibition, which features extraordinary designer garments, accessories, jewels, artworks and films from the remarkable period of creativity in Italy following World War II and the vibrant spirit in art, fashion and entrepreneurship that is the foundation of Italy today. The decades represented in the exhibition underscore NSU Art Museum’s special focus on art of this period. Bulgari has a longstanding affiliation with the worlds of fashion as well as art and is proud to present the Bellissima: Italy and High Fashion 1945-1968 exhibition. Modern Italian elegance was reflected in the gala’s black and white décor that was inspired by Italian design of the 1960s. The evening’s specially curated dinner menu was created by Italian culinary star, Roberto Di Pinto, executive chef at the Bulgari Hotel in Milan and combined creativity, innovation and the grand tradition of Italian excellence. Guests enjoyed Italian wines by Ferrari and Planeta. Bonnie Clearwater, NSU Art Museum Director and Chief Curator welcomed the evening’s distinguished guests and sponsors and introduced Gala Chair Stefano Tonchi, editor-in-chief of W Magazine, who is also a co-curator of the exhibition. She warmly congratulated the evening’s honorees, Fort Lauderdale-based collectors Dr. Stanley and Pearl Goodman and Francie Bishop Good and David Horvitz, NSU Art Museum Chairman, for their steadfast devotion and support of the museum. Gala Co-Chairs included: Bonnie Barnett and Robert Kagan; Daren Koenig Cronin and Ryan Cronin; Tara and Miles Forman; Francie Bishop Good and David Horvitz; Gucci; Lise Hirsch; Rita Holloway; Kering; Barbara and Michael Landry; Laura and Charles Palmer; Susan and David Samrick, and Lorraine Thomas. 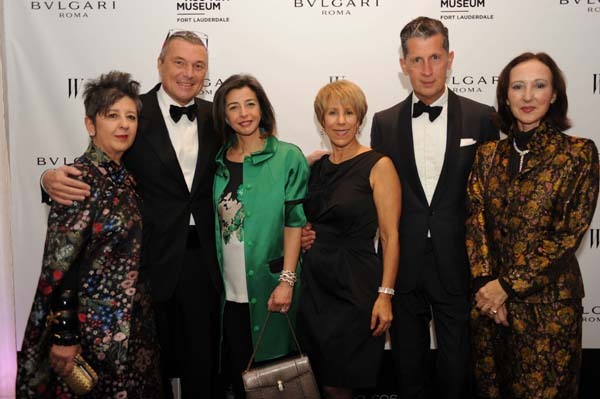 Among the prominent guests in attendance were: Jean-Christophe Babin, Global CEO Bulgari; Daniel Paltridge, President Bulgari North America; Lucia Boscaini, Brand and Heritage Curator, Bulgari; Gloria Marina Bellelli, Consul General of Italy in Miami; international collectors Jane Holzer, Beth Rudin DeWoody and journalist Firooz Zahedi; and Marvin Ross Friedman and Adrienne bon Haes; Monica Kalpakian; Sandra Muss; Laurent Claquin, CEO Kering Group Americas; Bellissima co-curator Maria Luisa Frisa and adjunct curator Gabriele Monti of University of Venice; Anna Mattirolo and Alessandro Bianchi of MAXXI: National Museum of the XXI Century Arts in Rome; Maurizio Forte, Trade Commissioner and Executive Director, Italian Trade Commission; George L. Hanbury, II, Ph.D., President Nova Southeastern University (NSU); Patrice Humbel of Vontobel Swiss Wealth Advisors AG; Wayne Gilmore of PNC Bank; Joe and Wini Amaturo; Albert and Beatriz Miniaci; and Tracy Mourning. In honor of the celebration, Bulgari invited prominent guests to wear jewels from their collection: Gloria Marina Bellelli wore a Serpenti necklace by Bulgari. Tracy Mourning wore a Diva pendant and earrings by Bulgari. Tara Forman wore a Serpenti bracelet and earrings by Bulgari. Daren Koenig Cronin wore Diva earrings and a Diva pendant by Bulgari. NSU Art Museum Fort Lauderdale is the sole U.S. venue for the exhibition Bellissima: Italy and High Fashion 1945-1968, which will be on view from February 7 through June 5, 2016. The exhibition, a project by the MAXXI: National Museum of the XXI Century Arts in Rome, is curated by Maria Luisa Frisa, Anna Mattirolo and Stefano Tonchi, and explores the remarkable period of creativity in Italy that gave rise to Italian high fashion (alta moda) and was notable for extraordinary contributions in Italian art, architecture, cinema, theater and photography. The exhibition is presented by Bulgari. Additional exhibition support provided by Consulate General of Italy in Miami, Italian Trade Commission, Vontobel Swiss Wealth Advisors AG, PNC Bank, Funding Arts Broward, Condé Nast, David and Francie Horvitz Family Foundation, La Rosa mannequins and Pelican Grand Beach Resort and media partner CBS 4. Billboards generously provided by Miles and Tara Forman and Austin and Christine Forman.